Jackson writes his almost daily blog, and is a syndicated writer for TakiMag.com. He contributes to Breitbart’s Big Government, as well as Human Events and American Thinker. His work has been been featured in Townhall magazine, and about all other national print media. 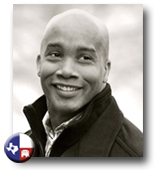 Along with being a Fellow at the Robert J. Dole Institute of Politics, Jackson earned his Bachelor of Science degree in Electrical Engineering from Southern Methodist University. He owned his own manufacturer’s representative agency in Texas and served as the Vice President of Sales for a Dallas-based technology firm. Jackson has been part of the executive management team for various IT systems integration firms, notables being Hitachi Consulting and CSC Consulting, and he has provided management consulting services to some of the world’s largest corporations. "You are more than your race, gender, or ethnicity. These things are very small aspects of who you are, yet these characteristics of you are constantly used by politicians to put you in a box, to separate you as an individual. Once you have been catalogued, the manipulation begins."